Nominated for the Maritime Foundation's 2018 Mountbatten Award for Best Book. View the full list of this year's nominations here. You'll be £60.00 closer to your next £10.00 credit when you purchase French Warships in the Age of Sail 1626–1786. What's this? Order within the next 2 hours, 25 minutes to get your order processed the next working day! The origins of a permanent French sailing navy can be traced to the work of Cardinal Richelieu in the 1620s, but this naval force declined rapidly in the 1650s and a virtually new Marine Royale had to be re-created by Colbert from 1661. Thereafter, Louis XIV"s navy grew rapidly to become the largest and most powerful in the world, at the same time establishing a reputation for the quality of its ship design that lasted until the end of sail. The eighteenth century was to see defeat and decline, revival and victory, but by 1786 the French Navy had emerged from its most successful naval war having frequently outfought or outmanoeuvred the British Navy in battle, and in the process making a major contribution to American independence. This book is the first comprehensive listing of these ships in English, and follows the pattern set by its companion volume on the 1786 - 1861 period in providing an impressive depth of information. It is organised by Rate, classification and class, with significant technical and building data, followed by highlights of the careers of each ship in every class. Thus for the first time it is possible to form a clear picture of the overall development of French warships throughout the whole of the sailing era. Certain to become the standard English-language reference work, its publication is of the utmost importance to every naval historian and general reader interested in the navies of the sailing era. This is a companion volume to the authors’ previously published work on the French Navy 1786-1861 details are given of every warship ship employed by French Navy during the period 1626-1786. Details of armaments, crew, tonnage, battles and subsequent fates are included. The authors are to be congratulated on producing such a mammoth work of research covering a Navy just as important as its British counterpart in the age of sail. Complete with Acknowledgments, Bibliography, Index and lots more. Excellent and highly recommended. 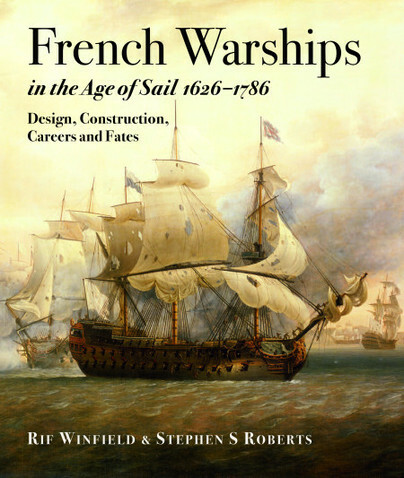 This book is a valuable research tool for all those interested in French naval vessels in the period between 1626-1786, regardless of their previous knowledge of maritime history. Winfield and Roberts have produced a superb addition to maritime history resources. humble transports, and the galley squadrons. This comprehensive compilation, built on decades of research by many authors, ensures students of naval history now have both sides of the Anglo-French order of battle across the Second Hundred Years War. Taken singly and jointly these volumes provide a level of detail and analysis that will inform the development of scholarship, in all forms, on this subject for decades to come. With glossary, tables, appendices, and bibliography this is a major work of reference. In this new book, the authors, naval historians, Rif Winfield, and Stephen S. Roberts, provide the first comprehensive listing of these ships in English, that follows the pattern set by its companion volume, on the 1786 – 1861 period, in providing an impressive depth of information. It is an indispensable volume for any researcher, maritime historian, modeler or serious student of the naval ships of the French nation. Rif Winfield has worked in the shipping and computer industries, has been for many years a charity director, has operated his own retail businesses (with his wife Ann), and has been a candidate for elections to Parliament and other levels of government, including serving as an elected Councillor and being appointed to government posts in health and in local government. A life-long researcher into naval history, he lives in Mid Wales and is the author of a number of standard works on the ships of the British Navy.